"No portrait of Hudson is known to be in existence. What has passed with the uncritical for his portrait—a dapper-looking man wearing a ruffed collar—frequently has been, and continues to be, reproduced. Who that man was is unknown. That he was not Hudson is certain." Thomas A. Janvier, biographer of Henry Hudson. The illustration featured here comes from the (presumably uncritical) Cyclopaedia of Universal History, 1885. Hudson's explorations of the arctic regions exemplify the relentless human quest to understand and master the environment. Facing extraordinary physical hardships, Hudson and his crew navigated through unknown regions in search of a commercial sea route to the Indies. Yet his greatest adversary proved to be not the harsh arctic elements but his own crew. Lacking empathy and abandoning their obligations as subordinates to the ship's captain, the mutineers dispatched Hudson, his teenage son, and loyal crew members to almost certain death in the arctic wastelands. Significantly, Hudson's exploration of the Hudson River led to Dutch colonial claims on the region and the establishment of the colony of New Amsterdam, later renamed New York following British defeat of the Dutch. Because Hudson appears first in written records in 1607, much of Hudson's early life is an unknown. Considering his eventual position as ship's captain, however, he likely spent many of those early years at sea. He probably started as a cabin boy and gradually worked his way up to the rank of captain. Historians know that Hudson was married to a woman named Katherine because she petitioned the British East India Company to send a ship to look for Hudson three years after his disappearance. After it became clear that Hudson was not coming back, Katherine appealed to the company for financial compensation, which she eventually received. Hudson had three sons—Richard, John, and Oliver. John served as a ship's boy on all four of his father's voyages, and the mutinous crew left him to die as well. Henry Hudson captained four separate, recorded voyages to the New World between 1607 and 1610, all of which took him into the treacherous—and then mostly unfamiliar—waters of the Arctic Ocean. In 1607, the Muscovy Company of England hired Hudson to find a Northeast Passage to China. On his vessel Hopewell, Hudson traveled just 577 nautical miles south of the North Pole and discovered what is now known as Jan Mayen Island before turning around and returning home in September. Jan Mayen Island later became part of the Kingdom of Norway. In 1608, again in the service of the Muscovy Company and on the Hopewell, Hudson made a second attempt to find a Northeast Passage. Ice-laden waters forced him to turn back, however, and a reluctant crew scuttled his hopes to search instead for a Northwest Passage. Hudson's lack of success in reaping any financial gain or meaningful discoveries from his first two voyages convinced the Muscovy Co. to give up on funding further expeditions. In 1609, the Dutch East India Company chose Hudson to lead an expedition to find an easterly passage to Asia. He was told to sail through the Arctic Ocean north of Russia, into the Pacific, and then to the Far East. Once again, Hudson could not continue his voyage due to the ice that had plagued his previous voyages, and many others before him. Having heard rumors by way of Jamestown and John Smith, he and his crew decided to try to seek out a Southwest Passage through North America. After crossing the Atlantic Ocean, the Half Moon sailed briefly in the Chesapeake Bay and Delaware Bay, but Hudson concluded that these waterways did not lead to the Pacific Ocean. Hudson then moved into New York Harbor and proceeded up what is today the Hudson River. He made it as far as present-day Albany, New York, where the river narrows, before he was forced to turn around, realizing that it was not the Southwest Passage. In fact, no Southwest Passage to the Pacific existed until one was created by the construction of the Panama Canal between 1903 and 1914. Along the way Hudson traded with numerous Native American tribes and obtained different seashells, beads and furs. His voyage established Dutch claims to the region and the fur trade that prospered there. New Amsterdam in present-day Manhattan became the capital of New Netherlands in 1625. In 1610, Hudson obtained the financial backing for yet another voyage, now under the English flag. For this voyage, the Virginia and British East India Companies provided the funding. 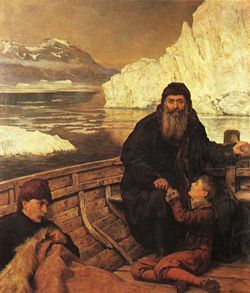 At the helm of his new ship, the Discovery, he charted a northerly course (some claim that he had deliberately sailed too far south during his voyage for the Dutch), reaching Iceland on May 11 and the south of Greenland on June 4. At that point, the crew began to think that the ship had finally found a Northwest Passage through the continent. On June 25th, the explorers reached the Hudson Strait at the northern tip of Labrador. Following the southern coast of the strait on August 2, 1610 the ship entered Hudson Bay. Hudson spent the following months mapping and exploring the eastern shores. In November, however, the ship became trapped in the frozen waters of James Bay, forcing the crew to move ashore for the winter. When the ice cleared in the spring of 1611, Hudson planned to continue exploring. His crew was disenchanted by that point, however, and wanted to return home. Believing that Hudson had pushed them too far, the crew mutinied in June, 1611. They set Hudson, his teenage son John, and seven crewmen loyal to Hudson adrift in a small open boat. The mutinous crew provided the castaways with no food, water or weapons. Clearly, they intended for Hudson and his companions to die. Hudson was never seen again, although some claim that he successfully made his way as far south as the Ottawa River. Only eight of the mutinous crewmen survived to return to Europe, and although arrested, none were punished for the mutiny and Hudson's death. Henry Hudson never discovered a Northwest Passage across the Canadian expanse or a Northeast Passage north of Russia, but he did make many important contributions to European navigation and exploration. On his first voyage, for example, Hudson discovered and made note of whale pods off the coast of Spitzbergen Island (today a possession of Norway). England later made commercial use of this discovery, declaring Hudson the "grandfather of the English whaling industry." 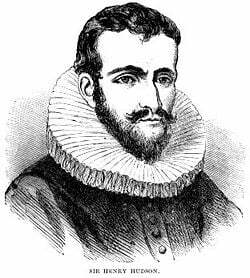 More importantly, Henry Hudson made crucial discoveries on his voyages to the New World. On his third recorded voyage, Hudson explored the area around present-day New York City, including the river that now bears his name. On his fourth and final voyage, Hudson explored what is known today as Hudson Bay in Canada. Henry Hudson's discoveries prepared the way for the development of Dutch colonies in present-day New York and the fur trade that developed in the region later. For these achievements, he is one of the most significant of the early European sailors who explored the New World and is the namesake not only of the river and bay, but of the city of Hudson, New York, New York City's Henry Hudson Parkway, and many other memorials. ↑ "Hudson's Background and Early Years," IanChadwick.com. Hudson's Background and Early Years Retrieved August 1, 2007. ↑ Henry Hudson's First Voyage Retrieved August 1, 2007. Samuel. Henry Hudson's Voyages, from Purchas His Pilgrimes. March of America facsimile series, no. 19. Ann Arbor [Mich.]: University Microfilms, 1966. Henry Hudson - A Brief Statement Of His Aims And His Achievements by Thomas A. Janvier, at Project Gutenberg. This page was last modified on 16 December 2017, at 16:59.